Pittsburgh Underground: Artsy Fartsy: Pittsburgh Annual Zine Fair's Week of Events Starts TODAY through SUNDAY!!! Artsy Fartsy: Pittsburgh Annual Zine Fair's Week of Events Starts TODAY through SUNDAY!!! Greetings once again kids! Just a quick reminder that the 4th Annual Pittsburgh Zine Fair is kicking off a series of events starting today, Wednesday, September 24th through Sunday, September 28th! Since it’s debut at Artist Image Resource in 2011, The Pittsburgh Zine Fair (PZF) has attracted a diverse group of artists, writers and activists from across the region whose content may vary, but the format remains the same- the zine. An icon of DIY ethos and radical info sharing, the zine decentralizes media and vaults individual expression while remaining inexpensive. The first event starting on today, Wednesday, September 24th, will be held at Copacetic Comics (3138 Dobson Street, Pittsburgh, PA) for a signing with international cartoonists Michael DeForge and Simon Hanselmann from 7pm to 10pm. Thursday, September 25th at the Harris Theatre (809 Liberty Ave, Pittsburgh, PA), John Porcellino visits the Steel City with his new release, “Hospital Suite” and the screening of the documentary film on his life and work “Root Hog or Die” at 7pm. Check out the trailer below! On Saturday, September 27th, the PZF will host the Zine Fair Mixer at the Bunker Projects (5106 Penn Avenue, Pittsburgh, PA) from 7:30-11pm for a $5 suggested donation. Vendors, Nils “Balls” Hanzcar, Juan Fernandez, Catherine Conley of Steer Queer, Maggie Lynn Negrete, Thom Delair, Erin Oh, Natty Soltesz, and Kelly Thomas of Wild Age Press will read from their zines amidst a casual environment in which vendors and the general public can interact before attending the PZF on Sunday, September 28th. Readings will start at 8pm. 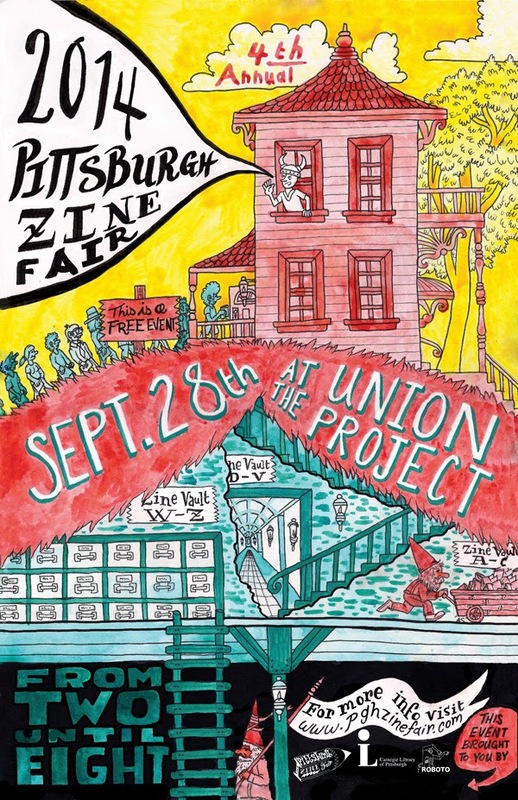 From there the 4th Annual Pittsburgh Zine Fair will held this Sunday, September 28th at the Union Project (801 N Negley Ave, Pittsburgh, PA 15206). The fun begins at 2pm and lasts till 8pm. Mr. Roboto Project and Carnegie Library Zine collections, hands-on activities and local djs will be featured in the atrium while vendors pack the Great Hall of the Union Project. This event is always free to all-age attendees. Then on Wednesday, October 1st at Lili Cafe (3138 Dobson St., Pittsburgh, PA), local comics makers are invited for the first of routine monthly meet-ups, hosted by Frank Santoro from 7 to 9pm. For more info on all the events, contact Maggie Negrete (724-554-3790) or email at pghzinefair@gmail.com or mgglnt@gmail.com . Also, check out the Official Pittsburgh Zine Fair Website for even more info! A lot of really great events aimed at inspiring you and your creative DNA over the course of five big days of fun! Hope to see you there!